Tennessee’s largest and most popular gardening event will return February 28 – March 3, 2019, at The Fairgrounds Nashville. On Friday, March 1, at 2:00 pm, the Nashville Rose Society with host an interactive workshop on the secrets to growing beautiful roses. Learn everything you need to know to grow beautiful roses in Tennessee from this interactive workshop designed to introduce rose care to the beginner or novice – from preparing your soil and selecting and planting your roses to watering, fertilizing, spraying and pruning. The workshop is conducted by Ron Daniels, Co-President of the Nashville Rose Society and a Master Rosarian. Ron will share his proven techniques for growing and caring for roses that have enabled him to win numerous awards as an exhibiting rosarian at local and regional rose shows. Ron will be joined by other members of the Nashville Rose Society who will be available to answer all your rose growing questions. Door prizes will be awarded to attendees who hold the winning tickets from a drawing that will take place during the workshop. In addition, all attendees will receive a copy of Ron’s presentation as well as a complimentary packet of information and tips for growing healthy roses. 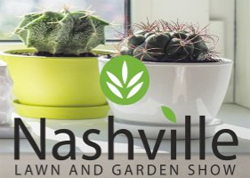 Visit www.nashvillelawnandgardenshow.com for more information.